Ever looked at the gorgeous Bi-Parting Grand Drape at a theatre and thought “that’s the look I want for our theatre (or school auditorium)”, but you didn’t know what the fabric was? Most likely, that Grand Drape was made of theatrical velour. 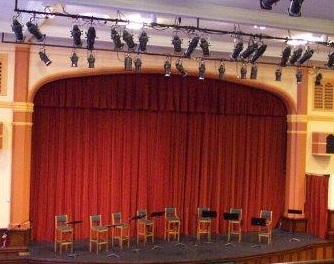 In the past, there were limited options for theatrical velour, but today there are many different theatrical velours to choose from when purchasing a custom stage curtains. Today I thought I would tell you a little bit about the two principal categories – Cotton Velour and Synthetic Velour. Cotton velour has been the primary option for theatrical drapery for many years. Topically treated for flame retardancy, cotton velour is a napped fabric available in a variety of weights, from a lighter weight 16oz per linear weight to as much as 32oz per linear weight. Most theaters, however, will choose a midweight velour, such as 21oz Marvel Velour or 25oz Memorable, depending on their budget. Cotton velour is typically chosen as it offers the most “traditional” look and feel and is available in a wide range of color options. However, one drawback to cotton velour is that it can be less durable than synthetic velour. Also, as topical flame retardancy will dissipate over time, the fabric will generally need to be retreated for flame retardancy at some point during the life of the drape. Over the last ten years or so, synthetic velour options have become increasingly popular for Grand Drapes. As with cotton velours, synthetic velours are also available in a variety of weights, but again the most popular are the mid-weight options. Synthetic velours may be napped (similar to cotton velours) or, as in the case of 22oz Encore, may have a brushed surface that mimics the appearance of a nap. As polyester fibers are less impacted by normal wear-and-tear than cotton fibers, synthetic velour will typically be more durable. In addition, synthetic velour is permanently flame retardant, meaning that, with proper maintenance, the fabric should remain flame retardant for the life of the drape. Color options for synthetic velours also tend to be slightly more limited than with cotton velours. There are other fabrics under the general category of “theatrical velour” that might be used for stage curtains – from lighter weight synthetic velours (such as 13oz Apollo Velour), Crushed Velvet, and velour alternatives such as 8oz Super-Vel, these fabrics are more often chosen for alternative Grand Drape styles, such as Austrians, Brailles, and Contours, which work better with lighter-weight fabrics, rather than for Bi-Parting Grand Drapes. Adding some sparkle and drama to your special event or production has never been easier! Using some fabulous rental Mylar Rain Curtains from our Oh So Swanky! drapery collection is a surefire way to wow your crowd, and also give your background some movement, light, and texture without overpowering the performers in front of them. Recently we were extremely proud to be a part of the stage design for California State University Long Beach’s Fall 2014 Homecoming MFA/Alumni concert, called “Romp Show.” Directed and choreographed remarkably by MFA student Kathleen Helm, these “energetic and spunky” dancers were able to do incredible feats of modern dance on a stage lit enchantingly by Elisha L. Griego, wearing costumes creatively designed by Liz Carpenter, and all in front of some dazzling 23’h Mylar Rain Curtain theatrical stage drapes. Mylar Rain Curtains are extremely lightweight and durable making them a breeze to hang, but even more impressive is that they be lit up in a multitude of ways in order to help create the exact mood and motif you are going for with each scene, making these a lighting designer’s dream come true. You can see from these photos expertly taken by Gregory R. R. Crosby that not only did the drapes add a little glitz and glamour to the overall stage design, but that they also helped set the whimsical, bubbly mood that Helm was very successful in creating with her amazing choreography and spirited dancers. 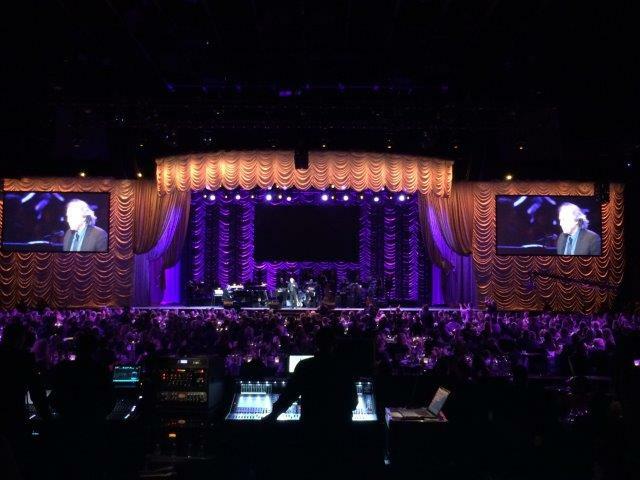 We love it when our clients are able to use our rental drapes to help make their event extra special, and this performance is a perfect example of how using the right drapes to help create the right look for your stage design is especially rewarding. 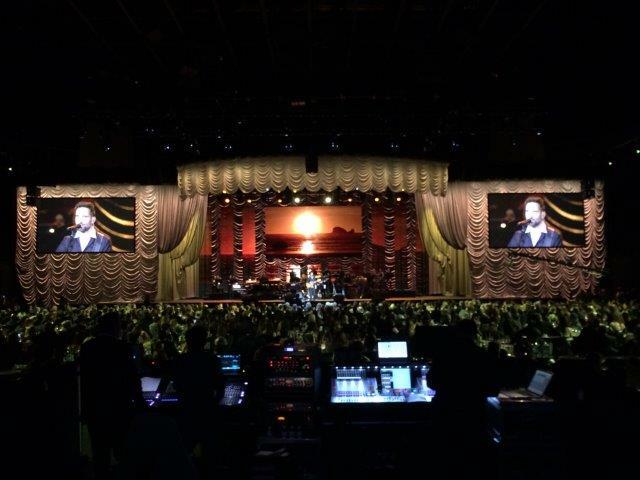 We were thrilled to be a part of this year’s 2014 Latin Grammy Awards, and were excited to see how their incredible team of designers were going to utilize our beautiful rental drapes for what is arguably considered “the biggest night in Latin Music”. Led by brilliant designers JJ Wulf and John Monaco, they decided they wanted drapes that would not only give a huge dramatic impact on the overall stage design, but also be versatile enough to be used throughout the show behind a multitude of today’s hottest Latin artists. Starting with our gorgeous 30’h x 60’w Crushed Silver Satin Austrian drape from our Silver Satin Drapery Collection as their main backdrop, they were able to dress up the rest of their stage with a variety of our Silver Satin, Cloud Satin, Silver and Pewter Textura, and White Voile swags, swaggettes, Austrians, and legs to help create a breathtakingly beautiful design. These photos are a fantastic example of how adding a splash of theatrical stage lighting to these drapes can completely change the entire look and feel of the design, without having to actually change a single drape. Since the show would be watched by thousands of people in person and by millions of people on TV and online, the designers knew they had to create a look that would wow the audience and yet work with a multitude of performers and presenters. You can see by these photos that they clearly succeeded! We love it when our clients “think outside of the box” and mix and match drapes from our rental drapery collections to create a look that is truly unique, and remains unforgettable long after the special event is over. We have, over the years, evolved the Christmas events to fit the mood of the staff and the needs of the schedule. This year we put the party activity to vote – and had an overwhelming response to try a pot luck party – one that is multi-cultural and where everyone can bring something that they love and cook “best”. I am really looking forward to it. Going to be great! So we will hunker down with some hearty appetites on the 23rd and see what culinary treasures come our way. Being that I am an Aussie – perhaps I should look into finding some good old 4n20 Meat Pies! Hmmm…. Let me get on that! As for music and games – there will be plenty – we are not shy when it comes to enjoying a dj and taking some time out to dance off the delights of the buffet table. Crispin and Sweetie the office dogs will be there too – would not be a party without them. So as you all settle into your holiday routines – from our offices to yours, we wish you a very happy and healthy holiday season – filled with fun, friends and family. Stay warm and safe – and I will see you on the treadmill in 2015! We love it when our rental drapes work out perfectly for our clients, and in ways they might not have even fully anticipated. 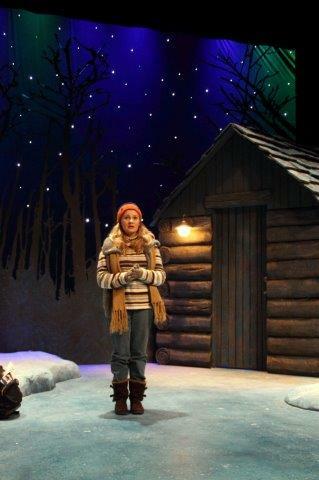 Recently, one of our fantastic clients, Aurora University, was putting on a production called Almost Maine. Their story description is as follows: “On the coldest night of the year in the town of Almost, Maine, love is in the air, glowing in the Northern Lights”. 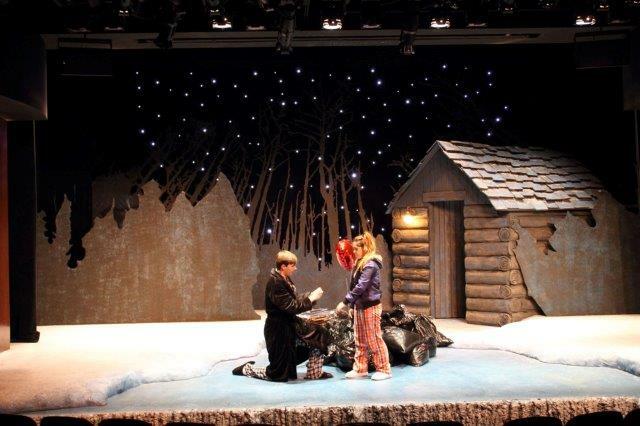 With this production being about a story that takes place in the heart of winter and often under a starry sky, they decided to rent one of our beautiful and versatile Stardrop LED drapes for their show, and it was a complete success! Quick to install and extremely easy to operate, our Stardrop LED drape ended up being the perfect backdrop for a production that ended up having numerous lighting elements for various types of scenes. These drapes offered not only the delightful and dramatic “starry sky” effect they were hoping for, but the rich black velour material also offered a great “void” for some scenes that needed to stay nice and dark. An added bonus for them was that these drapes also became a great projection surface for the “Northern Lights” lighting effects, too. This backdrop helped to create the look and feel they were going for from scene to scene without having to change through a bunch of different types of drapes. Scenic Designer Tavia DeFelice created incredibly stunning lighting and stage designs for this production, which was also photographed superbly by John Curran. We are so thrilled when our drapes help our clients create the exact look they are going for, and we were honored to be a part of this exceptional stage production, too.